Energizing Carb Optimizer Blend (Maltodextrin, Rice Bran, Oat Fiber), Metamyosyn® Muscle Mass Optimizer Blend (Whey Protein Concentrate, Milk Protein Concentrate, Calcium Sodium Caseinate, Creatine Monohydrate, L-Glutamine, Dried Egg White), Cocoa (Processed With Alkali), Multivitamin Optimizer Blend (Dipotassium Phosphate, Calcium Lactate, Di-Calcium Phosphate, Potassium Citrate, Potassium Chloride, Beta Carotene, Tricalcium Phosphate, Ascorbic Acid, Dl-Alpha Tocopheryl Acetate, Ferrous Fumarate, Niacinamide, Zinc Oxide, Copper Gluconate, D-Calcium Pantothenate, Manganese Sulfate, Pyridoxine Hydrochloride, Vitamin A Palmitate, Thiamin Hydrochloride, Riboflavin, Chromium Picolinate, Folic Acid, Biotin, Sodium Molybdate, Potassium Iodide, Sodium Selenite, Phytonadione, Cholecalciferol, Cyanocobalamin), Natural And Artificial Flavors, Non-Dairy Creamer (Sunflower Oil, Maltodextrin, Sodium Caseinate, Mono- And Diglycerides, Tocopherols (added to protect favor), Calcium Phosphate), Lean Lipid Optimizer Blend (Medium Chain Triglycerides, Sunflower Oil, Flaxseed Powder), Cellulose Gum, Xanthan Gum, Guar Gum, Carrageenan, Sucralose, Salt, Sodium Citrate, Acesulfame Potassium, Gelatin. For adults, mix four (4) scoops (640 calories) (167g) to 16 ounces of cold water and mix thoroughly in a blender or shaker. For increased calories, use 16 ounces of skim milk (806 total calories) or 2% milk (884 total calories) instead of water. Increase or decrease the amount of liquid to achieve desired consistency. Drink immediately for best results. As a reminder, discuss the supplements and medications you take with your health care providers. Energizing Carb Optimizer Blend (Maltodextrin, Rice Bran, Oat Fiber), Metamyosyn® Muscle Mass Optimizer Blend (Whey Protein Concentrate, Milk Protein Concentrate, Calcium Sodium Caseinate, Creatine Monohydrate, L-Glutamine, Dried Egg White), Multivitamin Optimizer Blend (Dipotassium Phosphate, Potassium Chloride, Calcium Lactate, Dicalcium Phosphate, Tricalcium Phosphate, Potassium Citrate, Ascorbic Acid, Dl-Alpha Tocopheryl Acetate, Ferrous Fumarate, Niacinamide, Zinc Oxide, Copper Gluconate, D-Calcium Pantothenate, Beta Carotene, Manganese Sulfate, Pyridoxine Hydrochloride, Vitamin A Palmitate, Thiamin Hydrochloride, Riboflavin, Chromium Picolinate, Folic Acid, Biotin, Sodium Molybdate, Potassium Iodide, Sodium Selenite, Phytonadione, Cholecalciferol, Cyanocobalamin), Natural And Artificial Flavors, Non-Dairy Creamer (Sunflower Oil, Maltodextrin, Sodium Caseinate, Mono- And Diglycerides, Natural Tocopherols), Calcium Phosphate), Cellulose Gum, Xanthan Gum, Lean Lipid Optimizer Blend (Medium Chain Triglycerides, Sunflower Oil, Flaxseed Powder), Guar Gum, Soy Lecithin, Carrageenan, Acesulfame Potassium, Salt, Sodium Citrate, Dextrin, Sucralose, Gelatin. Contains high fiber and top-quality complex carbs to intensify the time release effects of the Metamysyn Muscle Mass Optimizer Blend and keep you pumped with nutrients for a longer period. This specialized blend contains 64g of complex carbs, providing about 80% of the total carbohydrates in MET-Rx Xtreme Size Up (79g total carbs). Contains just the right amount of dietary fats per serving. We know that your goal in your workout is to pack inches onto your biceps rather than your waist, so we didn't compromise quality with loads of unhealthy fats that could slow down your progress. In order to make serious gains, you need to train hard, get lots of rest, and take in plenty of key nutrients. 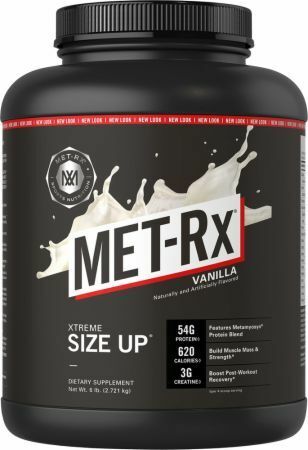 MET-Rx Xtreme Size Up makes it easy to get the high quality protein, complex carbs and essential nutrients that are important for a serious, intensive training program.